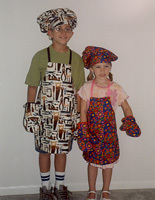 We make 2 sizes of children's aprons. Our small apron should fit most children, ages 2 through 7. 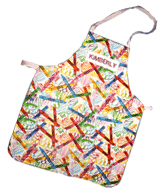 Our junior aprons should fit most children ages 7 through 12. Our small mitts are for small hands and measure approximately 8" tall and 4" wide. Our junior mitts fit adults and teens. They measure approximately 9" tall and 5 1/2" wide. Our children's apron has 4 pockets across the bottom. Our junior apron has 2 pockets. Our aprons are made with a cotton print front and a cotton muslin back. They have a solid loop that goes over the head and straps on the sides that tie in the back. 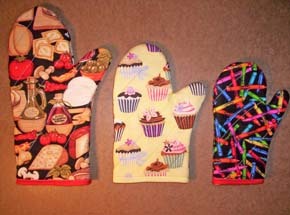 We make 2 sizes of children's oven mitts, child size and junior size. Our oven mitts are made with your choice of a cotton print and are lined with a heat resistant thermolam pellon and an aluminized fabric used for ironing board covers. All of the mitts are hand made to order and cost $18.00 a pair. To round out the ensemble, we also offer a chef hat out of the same print chosen, with a velcro closure at the back so that it fits a variety of head sizes. Cookbook and sample page Regular price $17.00. Our price $14.50.